Now these two here took the most time to do. The female star player is a very pretty sculpt, but there is one flaw to her: There's a mould line running right along her face, running slightly to the right of the nose. Really takes some work to get rid of that properly. Now for the male one. 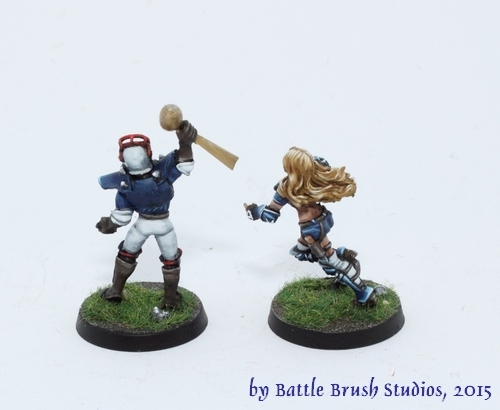 You see, the customer I painted these for wanted this bunch of models to be a present for his friend's wedding. Said friend is a big fan of Tom Brady of the New England Patriots. Hence the 12 on the armour and the general colour scheme. 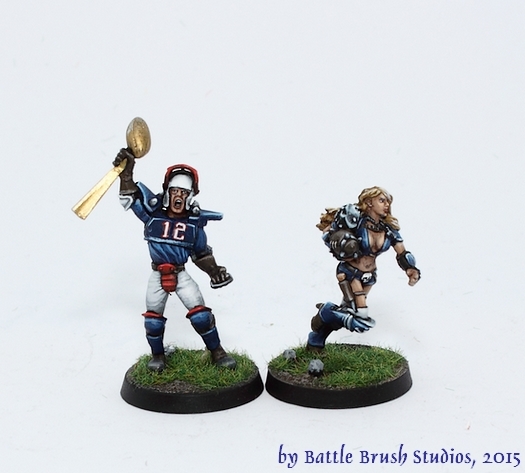 I also had to convert the model to hold this mini replica of the Vince Lombardi trophy rather than the Blood Bowl cup the model normally holds. I had to replace the hand and the trophy he's holding I sculpted from Miliput.